On his/her first day of camp, your dog will be the first in the play yard, along with a counselor, for five to ten minutes so that he/she can become familiar with the sights, sounds, smells, and atmosphere of the play area. After that, we will introduce one dog at a time so your dog will not become overwhelmed or intimidated. 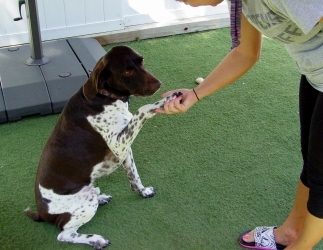 Counselors remain alert throughout the process for any signs of fear or aggression in both your dog and the campers. At the end of the morning, or the end of camp, you will be called with an update on your dog's behavior and whether or not they have passed our temperament evaluation. During this process, you are welcome to stay and wait in reception. We do not allow pet parents to be present outside or in the basement during evaluation, because your dog's behavior is different with your presence, and you won't be with him/her on camp days. We need to observe his/her behavior without bias. It is also an issue of liability. If you would get hurt on our property, whether due to a dog or otherwise, we are legally responsible. To avoid any unfortunate accidents, we ask you to either wait in reception or return after your dog's evaluation is complete. The evaluation can be done in a half or a full day. We will work with your schedule. If you feel your dog may be overwhelmed with a full day, we can do a morning session. If you would like a full or half day, please drop off between 6 AM and 8:45 AM. If you choose the half day, please pick up between noon and 2 PM. We do not accept every dog that wants to become a part of day camp. As much as we would like to accept every dog, not every dog is cut out for a daycare setting, and we recognize that. It doesn't mean your dog is a "bad dog." 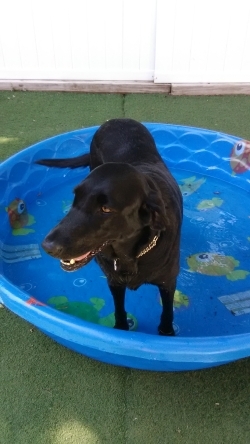 If we do not feel your dog has the temperament for camp, we will call and your dog can be picked up at your convenience. Just a note: If your dog is not a good fit, don't feel bad. Just like humans, not every dog likes to be in a group, and not all dogs relate to other dogs; they prefer the human touch. It's not a bad thing.